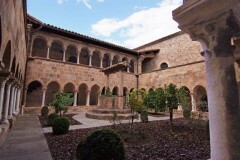 The cathedral of Fréjus is part of a complex comprising a baptistery, a cloister and the bishop’s residence. It lies between the Rue de Beausset, Place Formigé, Rue de Fleury and Place Calvini. The baptistery dates back to the 5th century and is one of the oldest buildings in France. The cathedral contains two naves and traces back to an older Basilica. The first Bishop of Fréjus was put in power by Emperor Constantine. The cathedral’s actual state is an early example of the gothic style in Provence. The gothic archway has a double-winged porch with carvings from the 16th Century, which are only shown on a guided tour. In the church, there is an altar of Saint Marguerite in gothic style and two tombs of the bishops Camelin (17th Century). The cloister was constructed in the 12 th and 13 th Century. It consisted of two floors; only one gallery has been preserved on the first floor. On this floor also lies a museum with roman excavations. The baptistery is a square construction which displays an octagonal form in its interior. The octagonal baptismal font is located in the centre of the room. Coming from the entrance, you can see a baked clay basin (dolium) for feet washing on the left of the font. Childs to be baptised entered the room through the small side-door on the left and left it through the high one on the right.